Tenants stop paying rent for all sorts of reasons. Landlords often find themselves in this predicament where the tenant either delays payment of rent for months or simply refuse to pay . 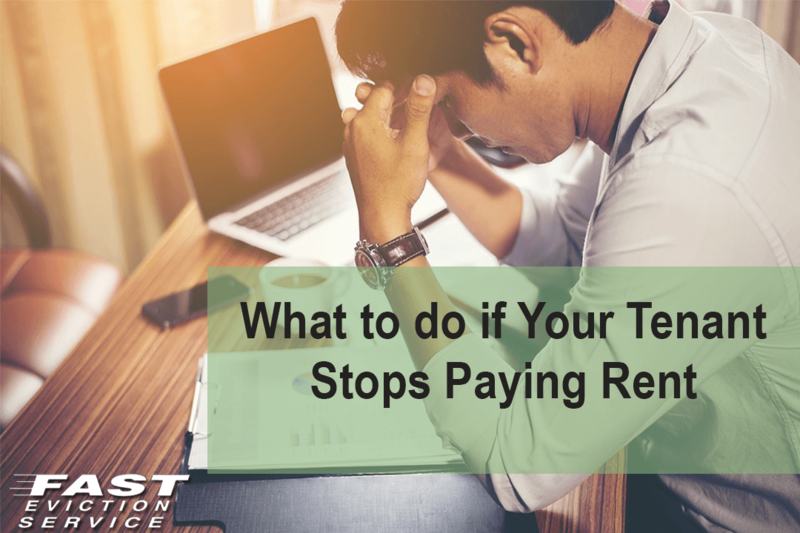 So what should you do if your tenant stops paying rent? Of course you would be frustrated since you must be having your own financial commitments and overheads to consider. However, getting into a dispute with the tenant may not be a wise decision in this situation; the key is to act reasonable but at the same time decisively. Don’t forget that you must stick to the law at all times while dealing with tenants who have stopped paying rent so as to prevent legal complexities later. Abiding by the law helps in resolving the problem without any unnecessary trouble. However, it requires an understanding of the law to act according to it. What are the Rights of Landlords? Every state has a different set of rules that determine the rights and duties of both the landlord and tenant but it is a universal rule that landlords can charge rent for their property and receive rental payments according to the pre-determined schedule. If the tenants decide to move out, they need to send the landlord proper notice explaining that they intend to end the tenancy. However, nowhere in the world does a tenant exercise such power to withhold the rent even if there is a dispute between the two parties, i-e, landlord and tenant. The Citizen’s Advice Bureau highlights that tenants aren’t legally allowed to stop paying rent and they put themselves at risk of eviction if they do so. Landlords are also allowed by law to explore the rental history of their tenants (both prospective and existing) including the resources of rent payment. Landlords can check for any rent defaults and/or property damage that might be registered in the tenant’s name. The information is important in strengthening the trust of landlord over tenants. What to do when Tenant Stops Paying Rent? Or it could simply be that your tenant does not want to pay the rent. You need to address the issue as quickly as possible to ensure your own financial stability and peace of mind. The key to fixing the issue is to keep records of all the payments and correspondence between you and your tenant. To resolve the issue start with making a direct phone call to the tenant or a better idea would be to send a written letter and keep a copy of this letter with you. This would be helpful if at any point you get involved in legal proceedings. If the tenant and landlord agree to settle the issue and tenant promises to catch up on the missed payments, then don’t forget to keep the settlement agreement in written form and send to the tenant via post. Do mention the consequences of not following the agreement. After the passage of 21 days without payment of rent then you have the right to send the tenant a letter informing that you will be reclaiming possession of your property if payment is not made within a week or any specific date. If the deadline is missed by the tenant yet again, then according to the Housing Act 1988 landlords can claim possession of the property by following a format prescribed by the law. If you want to evict your tenant because they stopped paying rent, it is your right to ask the court to give judgment against the tenant for two issues; one, the rent owed and second, the expenditures made by the landlord in pursuing it. However, before reaching out to the court, you must think from every aspect such as if the amount of debt is worth the effort, expenses and time that you will be required to spend? It is a fact that for landlords, whether new or experienced, having to deal with a tenant who has refused to pay the rent is an extremely stressful situation. However, with time you will learn to deal with such stubborn tenants. An understanding of law will also be helpful in resolving the issue amicably and quickly. You must take notice and give importance to the matter when the tenant fails to pay the rent for the first time or when the tenant starts delaying the rent payment. Talk to your tenant right away to stop this behavior at an early stage otherwise, it would become a habit and you will have to wait longer and longer for the rent. Be wise and be strict in financial matters especially rent payment and you will never face such an issue with your tenant who stopped paying rent.